March is here and with it more snow, but the hope of Spring. 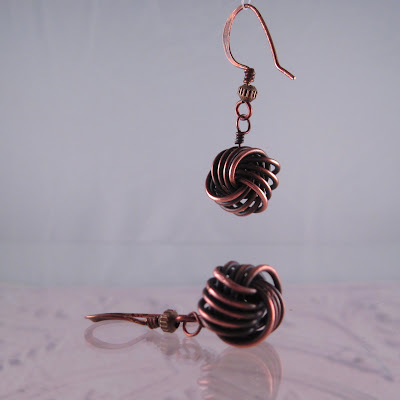 In honor of March and it's popular Holiday St. Patricks Day The FamiLee Jewels are giving away a pair of Copper Love Knot earrings to one lucky fan of our site. The knot uses 3 coils of wire. Each wire represents one of the forces of nature - earth, water and fire. Weaving them together in one continuous knot signifies unity, strength, spirit and being. The giveaway will run from now until March 31st. 1. visit our etsy store at http://www.thefamileejewels.etsy.com/ and choose your favorite piece of jewelry. 2. comment here on the blog or on our Facebook page about which piece you like best and why it is your favorite. 3.The winner will be chosen sing a random number generator. I will notify you of the winner on April 1st. The knot earrings are lovely! My fave in your shoop is this peace/tree necklace - its interesting to look at and has a lovely message. Great giveaway! My favorite is the pressed penny bracelet - reminds me of those machines I used to use as a kid! I love the Recycled Product Tree of Life Necklace. Beautiful things! Thanks for the chance to win. The winner is lucky number 3 Colleen Pierre. I was so happy to win these! They are gorgeous and I've received numerous compliments on them. Thanks so much!